The angular shape of the Diamante collection creates a distinctive elegance. * Doors and drawer fronts: Shaker Style in MDF Maple Wood Stained in Porto, E-15 (discontinued color). * Vanity top: Polymer in White Unimar Finish (U-00). Doors and drawer fronts: Heritage Style in Thermoplastic, White Wood Grain Matte color (R-54-W). Vanity top: Polymer in White Unimar Finish (U-00). A classic style that favors the elegant simplicity of straight lines. No molding to interrupt the linearity of doors and drawer fronts. Contact The Renovation Store for more information on our finishes. This style features raised panels for doors and drawer fronts. The molding is different depending on the finish material. Contact your nearest dealer for more information on our finishes or click here to consult our documentation. Melamine doors and drawerfronts with integrated molding. This style of door exists only in melamine. This style is characterized by doors and drawer fronts with grooves that form the Shaker-inspired frame. Strong and homogenous composite covered with ultra-resistant gelcoat polyester resin. One-piece vanity top, 3/4-inch thick. Faucet holes single, 4” or 8” included. 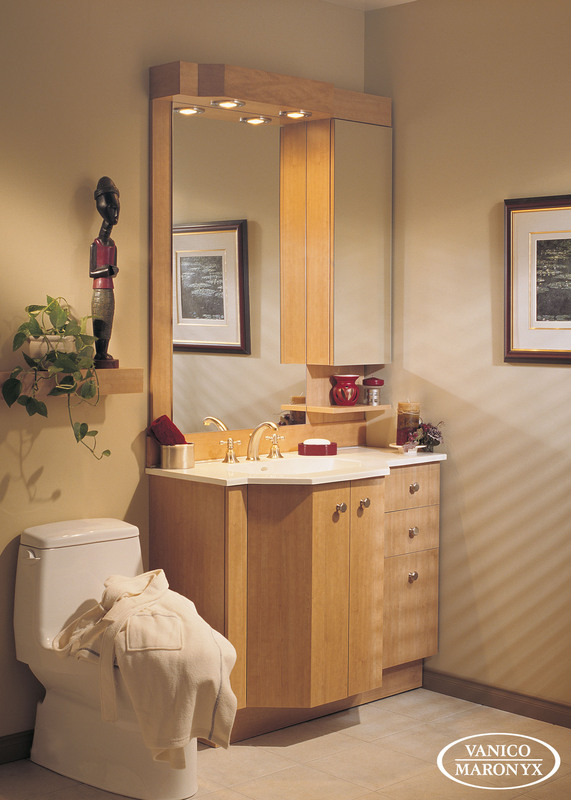 No visible joints: eliminates mildew around the basin. Compliance Certifications: CSA B-45; IAPMO/UPC; ANSI Z124.3; Listed in State of Massachusetts. Finish: Unimar (Ultra-brilliant), Satine (matte) or Nacryl (pearl finish). Colors: White (00), Biscuit (96) and usual bathroom colors. Unimar or Nacryl: Clean with a soft cloth or sponge and a non-abrasive bathroom cleaner. Never use abrasive creams or powders. Faucet holes single or 8" centre included. 2 coats of water-resistant sealant and 1 coat of stone wax applied in our factory. M-BP Bianco Perle, white bowl (00). Clean with a soft cloth and lukewarm water only. Once a month polish with a protective wax. Note: Natural marble can be damaged by chemical or agressive agents such as toothpaste, perfume, shaving cream, etc. In case of spills, remove immediately these products from the surface to avoid damage. Made of 95% selected natural marble pieces bonded with a special polyester resin. This Greenguard Indoor Air Quality Certified marble is made in Italy. 2 coats of water-resistant sealant and one coat of stone wax applied in factory. Greater uniformity of color & lighter weight than natural stone. Maintain the eye appeal of quarried marble while offering greater level of consistency and strength. *12" x 12" x 1/2" Tiles available. Clean with a soft cloth and lukewarm water only. Once a month, polish with a marble protective wax. Note: Agressive chemicals, acids or abrasive agents such as toothpaste, mouthwash, perfume, shaving cream, cosmetics, etc. must be used with great care. In case of spills, remove immediately these products from the surface to avoid damage. Polished glass with translucent surface tinged by a colored opaque bottom. Any window cleaning or water/vinegar solution will ensure that your countertop stays new for years to come! You can also make your own cleaner: mix 1/3 cup vinegar and 1/4 cup rubbing alcohol in a one quart spray bottle. Fill up with water.